One of the most important IRA administration compliance tasks is reporting. Consistently filing incorrect information returns is a red flag to the IRS, prompting questions, a possible IRS audit, and potential financial organization penalties. The 2017 Form 5498, IRA Contribution Information, is due to IRA owners and the IRS on May 31, 2018. Whether a financial organization generates these reports or has them processed by an IRA administration firm, they should spot-check at least 10 percent of the reports for accuracy. Mistakes can be made at the point of communication with IRA owners, during data entry, or later in processing. Forms 5498 are filed separately for Traditional, Roth, and SIMPLE IRAs; the type of IRA for which the report is filed is shown in Box 7. Following is Copy A of the 2017 Form 5498 along with general box-by-box reporting summaries. Specific reporting requirements can be found in the Instructions for Forms 1099-R and 5498. Other reporting requirements are described in IRS Publication 1220 for electronic filing, and in the General Instructions for Certain Information Returns. Enter all Traditional IRA regular contributions (including catch-up contributions) made in 2017, and those made from January 1, 2018, through April 17, 2018, as 2017 prior-year contributions if the January-April contributions were identified by the contributor as for the prior year. If a rollover or transfer is made from a SIMPLE IRA to a Traditional IRA before the two-year SIMPLE IRA holding period is satisfied, report the amount as a regular contribution in Box 1, even if the total amount exceeds the maximum annual contribution amount. Enter rollover contributions made to IRAs during 2017. Include retirement plan rollover contributions and rollovers, but not transfers, from IRAs. Direct IRA-to-IRA transfers are nonreportable. Enter the amount converted from a Traditional or SIMPLE IRA to a Roth IRA during 2017. Do not include employer-sponsored retirement plan rollovers to a Roth IRAs; these are reported in Box 2. Enter amounts recharacterized (including the earnings) from one type of IRA to another. Enter the December 31, 2017, fair market value of the IRA. This box is used for endowment contracts only. Issuers that maintain IRAs that were established as endowment contracts before November 6, 1978, and that accept 2017 premiums to those IRAs, report the amount of the premium entered in Box 1 that is allocable to the cost of life insurance. Mark the appropriate checkbox to identify the type of IRA for this report. Mark the “IRA” box for Traditional IRAs. Note that Traditional IRAs receive SEP plan contributions. Check the “SEP” box if filing Form 5498 to report information about a “SEP IRA.” If it is not known whether the account is a SEP, mark the “IRA” checkbox. Enter all SEP plan contributions received into the IRA from January 1, 2017, through December 31, 2017, in this box. Enter any SIMPLE IRA plan contributions received into a SIMPLE IRA from January 1, 2017, through December 31, 2017. Enter all Roth IRA contributions (including catch-up contributions) made in 2017, and those made from January 1, 2018, through April 17, 2018, as 2017 prior-year contributions if the January-April contributions were identified by the contributor as for the prior year. Check this box if the IRA owner must take a required minimum distribution (RMD) for 2018. Do not check this box for beneficiary accounts or for Roth IRAs. Check the box for the year the IRA owner attains age 70½, even if the RMD for that year need not be distributed until April 1 of the following year. These boxes may be used to satisfy the January RMD statement requirements. 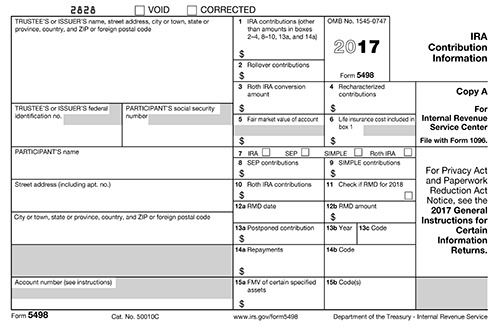 If the financial organization does not use Form 5498 for this purpose, these boxes should be left blank. If used for this purpose, enter the deadline for taking the RMD in Box 12a and the RMD amount in Box 12b. These boxes are used to report contributions made in 2017 for a prior year, which are postponed contributions or late rollover contributions for which the IRA owner self-certified under Revenue Procedure 2016-47. Postponed contributions are those made by individuals who serve in or in support of combat zones, hazardous duty areas, and federally declared disasters. Enter the postponed contribution or late rollover amount in Box 13a, the year for which the contribution is made in Box 13b, and the appropriate identifying code as described in the instructions (i.e., EO13119 (or PL106-21), EO13239, EO12744, FD, or SC) in Box 13c. Enter the repayment amount of qualified reservist distributions or designated disaster distributions in Box 14a. Enter QR for repayments of reservist distributions and DD for repayments of disaster distributions in Box 14b. These boxes are used to report the fair market value (FMV) of certain specified assets that do not have readily available FMVs, as identified by code descriptions in the instructions. Enter the FMV in Box 15a and the applicable code (i.e., codes A through H) in Box 15b. A maximum of two codes can be entered in Box 15b, and if more than two codes apply, code H should be entered.